I finally got some decent sleep and I'd like to talk a little bit about Else Walker. First off, thank you to everyone who played, beat, rated, and tweeted about the game. It's truly incredible that so many people had positive, and helpful reactions to Else Walker. Thank you so much for your time and kind words and critques! I am super proud of what VidaZen and I accomplished in 47.5 hours and I think our game has some fantastic moments. However, I'm not really going to talk about those moments in this post. I kind of want to pick apart how the game could be a little better and how the ideas in it could be improved. An On/Off Switch - This feature would just be a switch at the bottom of the screen that pauses all of Eddie's actions until it's flipped On. A lot of the frustrating portions of Else Walker come from Eddie just GOING without the player realizing what's happening. This can be a funny reminder to take things slow but more often than not I think it just leads to cheesing the floppies in and out rapidly. The gameplay should be more deliberate than that. More Thinky Puzzles, Less Twitchy Puzzles - I'll be honest, the "Enemy" levels are kind of a mess. I think they're a fun mess but they turn the game into a Platformer with bad controls (booooo) instead of a Puzzler with platforming elements (yaaaayyy). The "Spikes" levels are some of my favorites because your actions have to be precise and careful and the flow just feels right. These levels really went well with VidaZen's Polyphonic waltz. I think there might be room to do enemy puzzles at some point but I'd need a lot of playtest time. Floppy Box - I think if I took this game further, there would have to be a way to get all those floppy disks off of your screen and just simplify the experience. Maybe some sort of cardboard box that moves off to the side? Landscape, Not Portrait - God, I'm not sure why I did portrait orientation. It's so hard to see everything at once. I'd probably put the floppy disks and slots off to the side if I got another shot at this. I forgot how human eyeballs work. Abandoned Mechanics - I think I could have gotten a lot of mileage out of that gun and maybe a second Jump chip and that Boxing Glove I never implemented. Theme/Motivation Repetition - I actually really like our ending. I'd probably just put a few more tantalizing moonbeams in spots you can't access to remind players of the plot. Obviously there are more improvements to be made, bugs to fix, and stuff that's wrong with the game that I haven't even noticed yet. Else Walker isn't perfect and won't ever be, but again, I'm really, really proud of it. If you like the game's soundtrack as much as I do, check out VidaZen's Bandcamp. The Else Walker Soundtrack just went up this morning and you can download it for free or shoot him some dollars or something. This was our first time working together and I hope it's not the last cause this dude heckin' rules. If you liked the game and got stuck or just want to watch, Lokijki has already uploaded a Complete Else Walker Playthrough to YouTube. He is very chill and plays a lot of jam games and also rules. For doing such amazing, consistent and heartfelt work VidaZen and Lokijki are both criminally underfollowed. Please check out their work and support them because they are good. 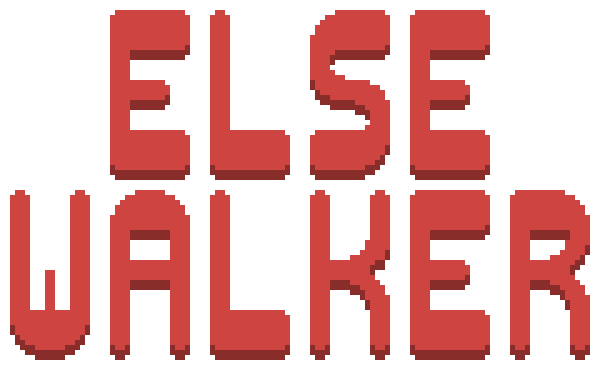 If you want to support me and the stuff I do you can buy my roguelike, rate Else Walker if you haven't, follow me on Itch and/or Twitter, and/or check out my tabletop podcast, Pretend Friends. I'm a full time indie dev and without constant begging I will die. Thanks for reading, I'm gonna play some more awesome GMTK JAM games!! A cycle indicator. I may be wrong, but I believe you run the If-Else If-Else loop in a cycle with a fixed interval. If a small circle animation was showing how close the player is to the cycle beginning, it would give them an opportunity to make more precise instruction swaps. Inexplicably, Eddie spawns in a new room off screen instead of on a first tile. I'd consider this a bug. The first sequence is amazing - you input a simple program and Eddie goes through the title screen on his own. It would be a great way to expose more story later. There is that one room with guns overhead, but the program was just "Walk" there. Lovely game, Kevin. You are an inspiration. These are great points! Part of the reason I spawn Eddie off screen is because he’s usually in “Walk” mode and I wanted to give players a little more time to take in their surroundings. But spawning him on the first tile in “off” mode would be waaaaaay more intuitive. Thanks! Really interesting read, thank you.